We all wear them: Clothes. We use them to keep warm, exercise, define ourselves, make political statements, but can we also use them to clean up our environment? 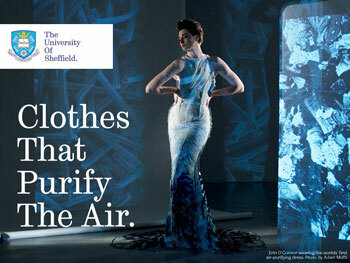 In an unlikely collaboration, successful fashion designer Helen Storey and polymer chemist Tony Ryan have collaborated to create the world’s first air purifying clothing. The science has already been used to create self-cleaning windows and paints. When nanoparticles of titanium dioxide come into contact with ultraviolet light, it causes pollutants to break down. By applying this to clothing, this technology can clean the air as we move through it, especially in urban areas, where pollution can cause severe health problems. 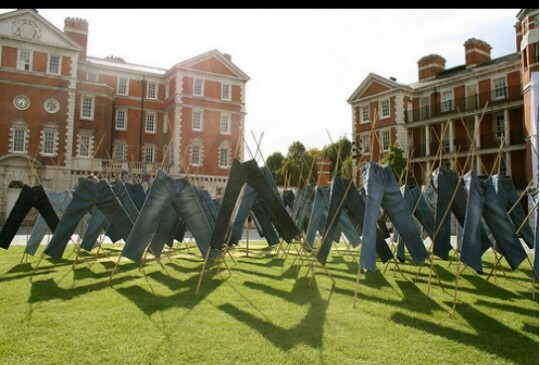 Catylitic Clothing expects to be on the market in the next two years, and is putting forth a series of cultural and artistic demonstrations, such as the “Field of Jeans,” above, to raise awareness about how science and fashion have collaborated to create environmental innovation.